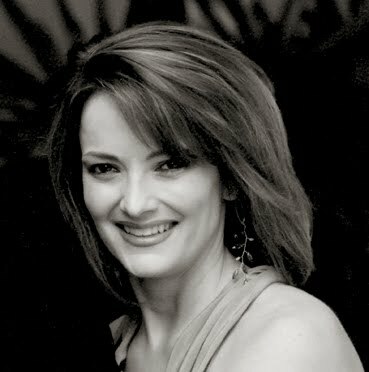 another wonderful sponsor....Dallas designer Laura Lee Clark is one of the blog's newest sponsors and I'm thrilled to have her. 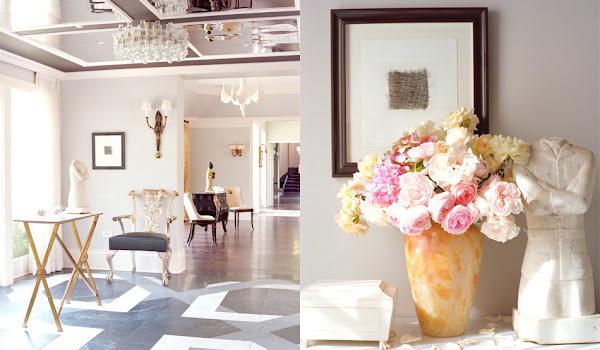 She's been creating interiors for some of the city's most influential and stylish people for 23 years, and is best-known for a look that mixes traditional and antique pieces with modern classics and contemporary art. 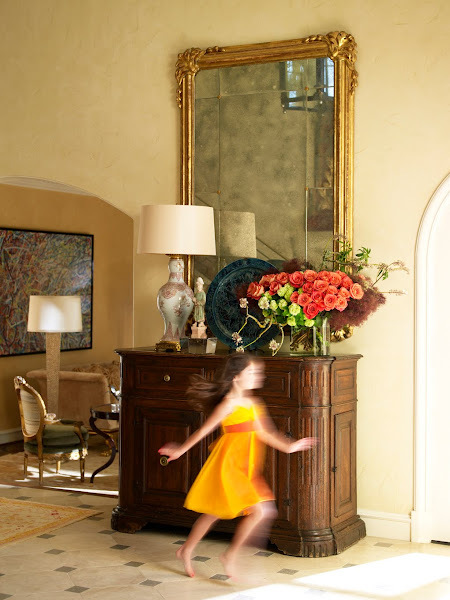 She studied in Italy at the Parsons School of Design, and you can see many of her French and Italian inspired rooms in Betty Lou Phillips' popular books, Inspirations from France & Italy, and The French Room. I've posted about Laura Lee's incredible black book of under-the-radar, highly skilled artisans before here. 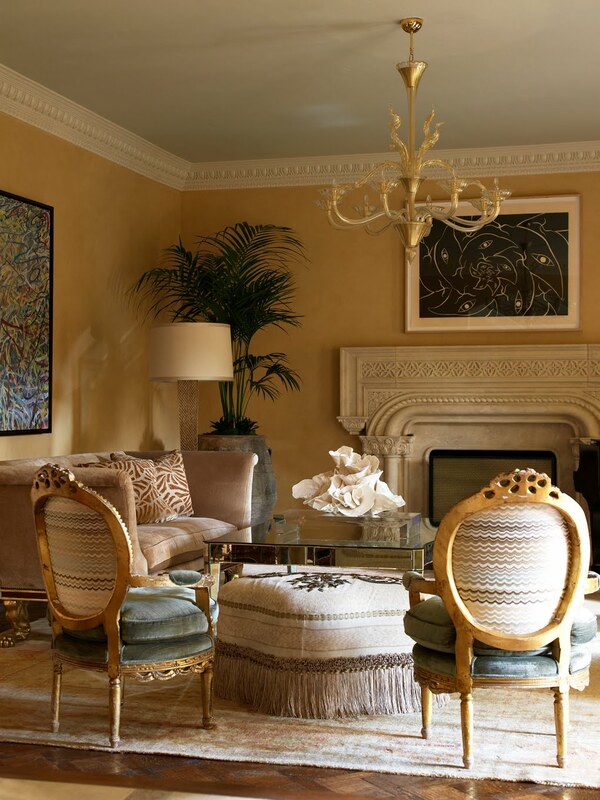 In Mike and Natalie McGuire's living room, Laura Lee Clark has mixed a flirty pair of antique French bergeres (covered unexpectedly in Old World Weaver's flame stitch), with a custom designed fringed ottoman, a mirrored table by Nancy Corzine, a gorgeous old Venetian glass chandelier, antique Oushak rug, and a graphic painting by James Surls. 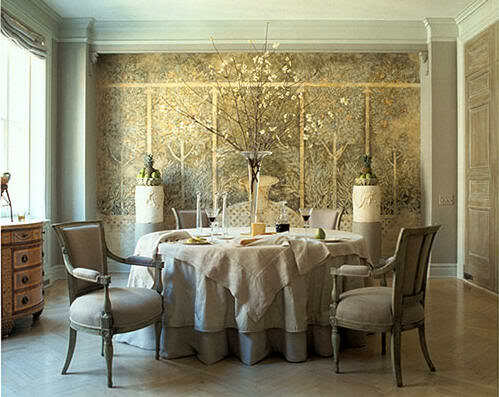 The Moorish inspired carving on the fireplace really pulls all the various patterns together. 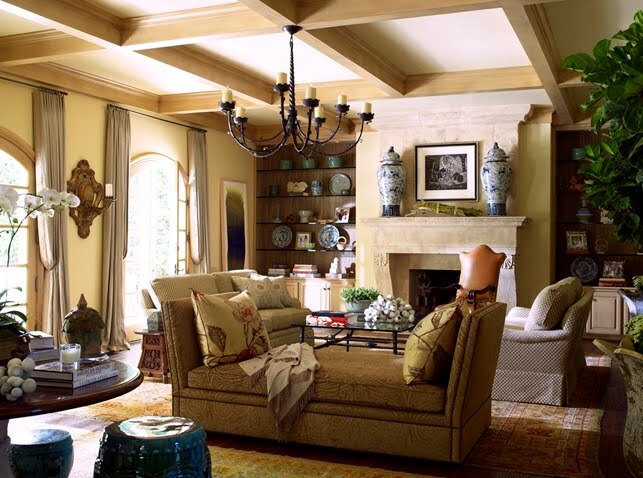 The McGuire's family room is big, like we like 'em in Texas. This 11,000 square ft. house, completely redone by Laura Lee Clark, originally belonged to Yankees third baseman Alex Rodriguez, a McGuire family friend, who coincidentally hit his 600th home run on Wednesday. Seven years ago the McGuires and Rodriguez swapped houses, with A-Rod moving into their Arcady Ave. house. The room's a mix of antique-style Chinese porcelains, custom upholstered furniture, and that's a Picasso linocut lithograph above the mantle. 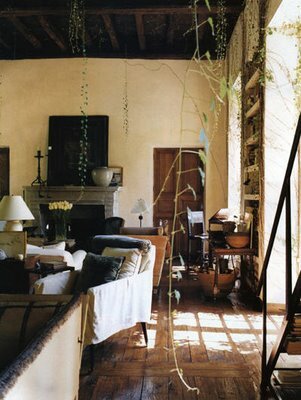 In the McGuire's lovely loggia, the Formations center table is piled with art books, interesting objects (such as the stone grapes) and spectacular potted white phalaenopsis orchids. 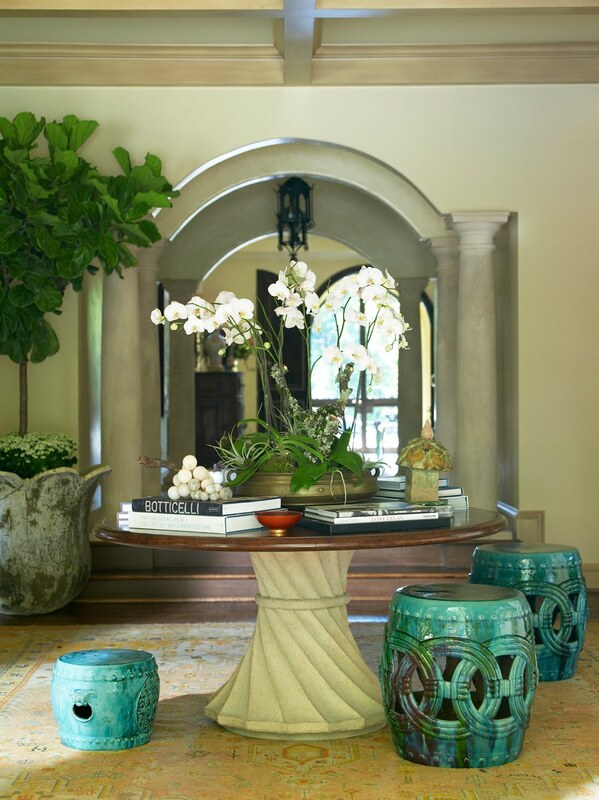 The green chinese garden stools are from George Cameron Nash and Ceylon et Cie. 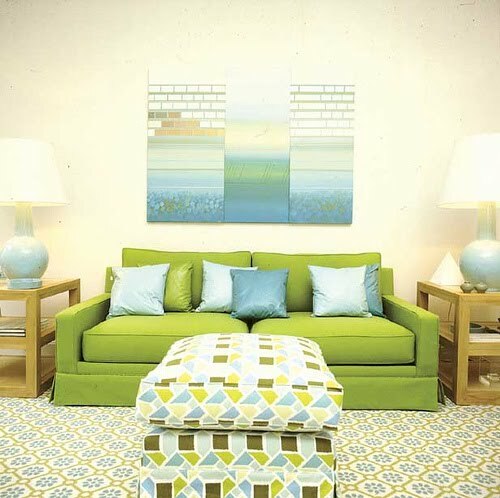 I love the fact that the stools are different sizes -- it throws things off just enough. This is a wonderful shot by my old friend, photographer Tim Kolk, who lives in New York but comes to Dallas to visit family and to shoot occasionally. The antique mirror and chest are from The Pittet Co., and the large painting at left is by Texas-born artist Sam Reveles, who's now living and working in New York. 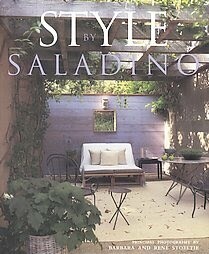 Houses Gardens People: Who are some designers whose work you admire? 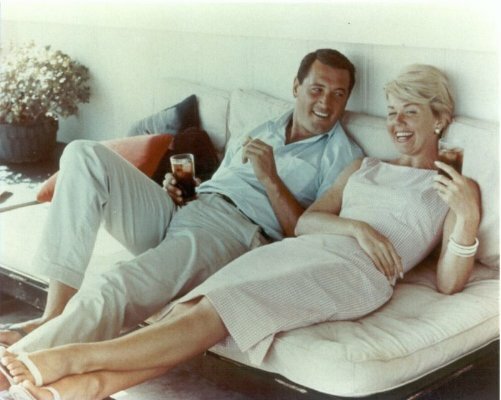 Laura Lee Clark: Pillow Talk with Doris Day and Rock Hudson has great interiors with attention to detail and a fun "wow" factor. 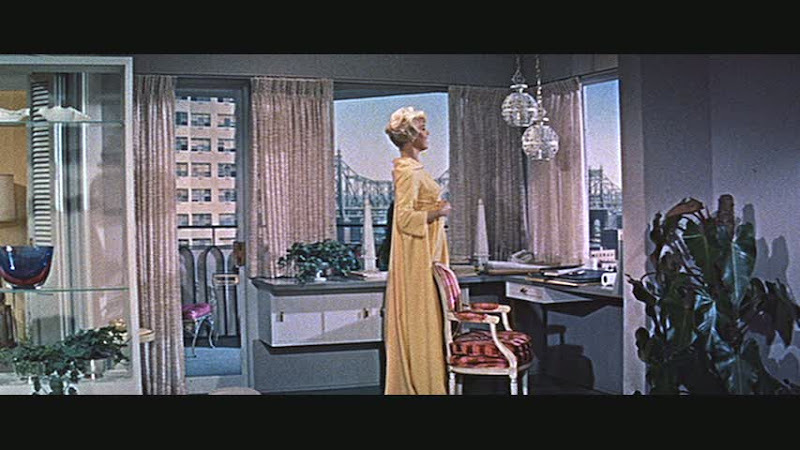 I always enjoy Alfred HIctchock movies and James Bond movies for interesting interiors, too.